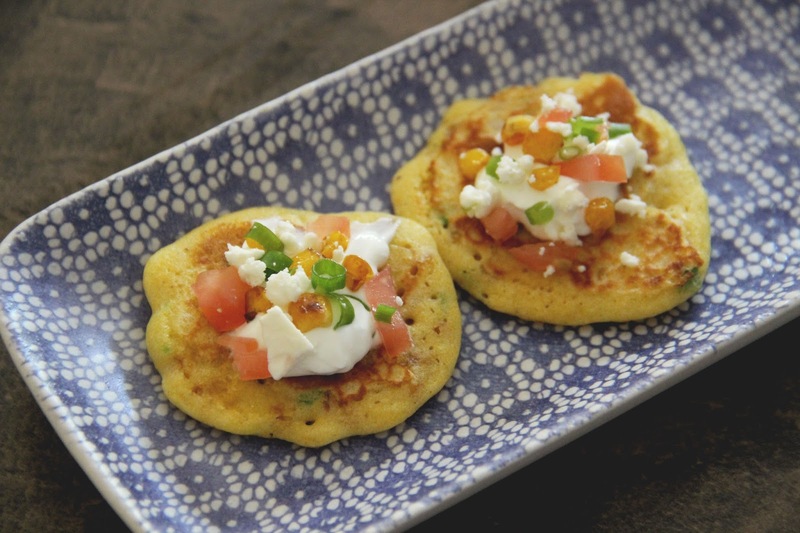 It's a must that I share this recipe for mini corn cake fritters. Not only are they delicious, bite size (well, i get about 2-3 bites out of it; my husband is a different story) and easy to make, but they're perfect for this fall-like weather that's been going on in southwest Virginia lately (middle of July and it's 72 degrees!). I have the urge to throw all the ingredients for a spicy chili into the crockpot and include these fritters as the side. But, maybe it's fairly hot in your part of the world and you're thinking this recipe isn't worth making until the temperatures drop. 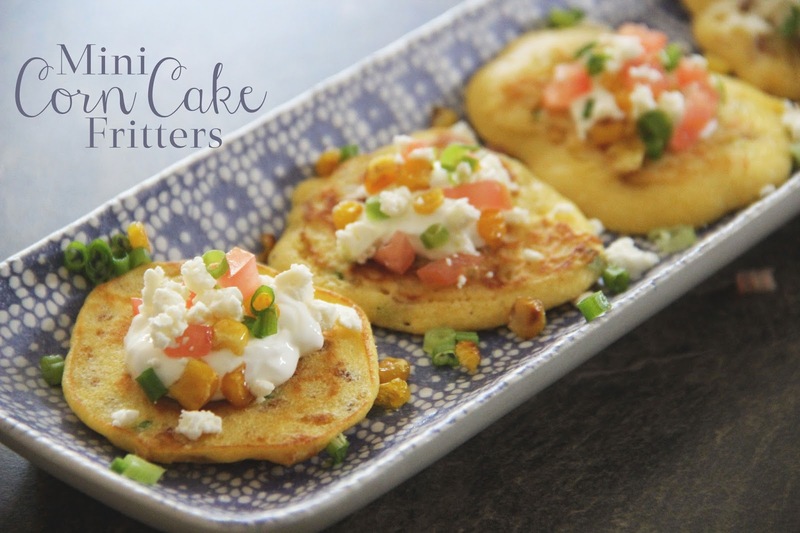 Think again because the sour cream that's tops these pretties is the 'icing on the cake' so to speak and gives the cake fritters a creamy, cold texture as you bite into one. So good! These cake fritters are great as appetizers and that's how I served them up. Plus they are easily prepared ahead of time, which is a lifesaver! 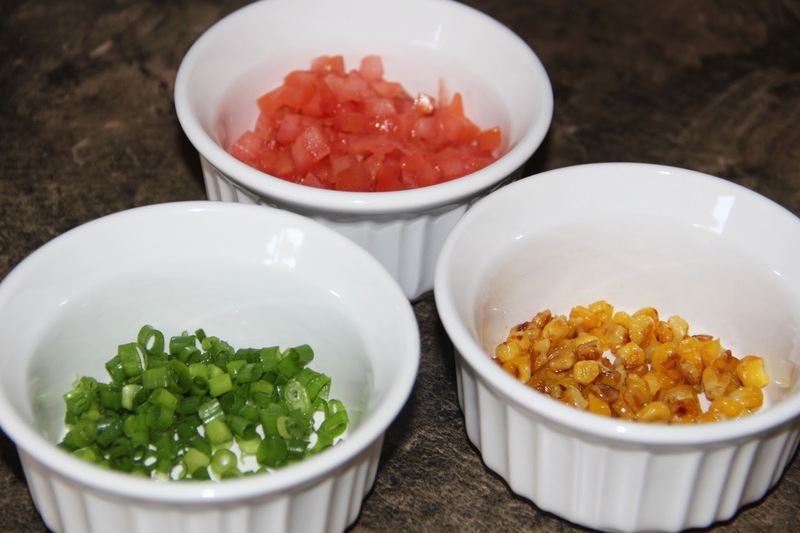 Heat olive in a skillet and add the corn kernels. Let the corn brown, but not burn. While the corn is browning combine the flour, cornmeal, kosher salt, baking powder, milk, beaten egg, and olive oil. Whisk well. Once the batter is clump-free and smooth, stir in the tablespoon of green onions. Once the corn has browned, save one tablespoon setting it aside, and add the remaining kernels to the batter. Stir well. In the same skillet the corn was browned in, add any extra oil/cooking spray so the cake fritter won't stick. Put the heat on medium. Drop the batter by two tablespoons (I literally used a tablespoon) for each cake fritter. Cook until one side is brown and flip (about a minute). Set aside. If making ahead of time, put in the fridge for up to 5 hours. Reheat by placing on a baking sheet and putting in the oven at 350 degrees for 5-8 minutes. 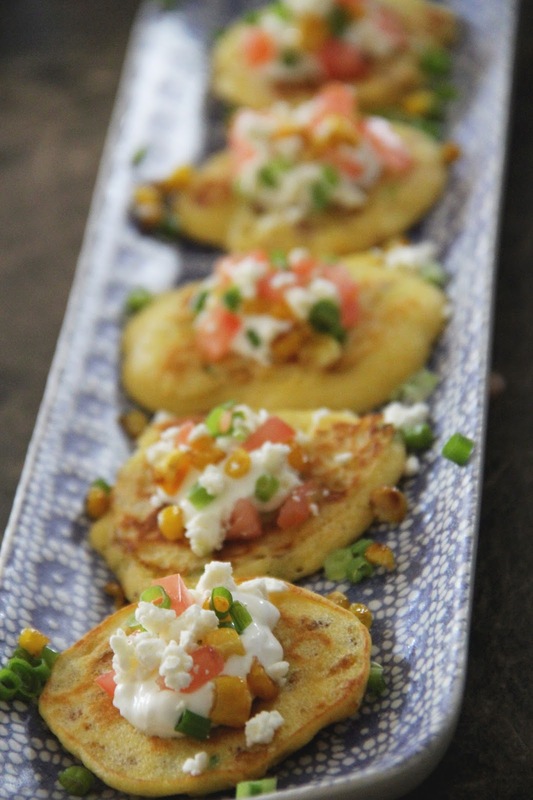 When ready to serve the heated cake fritters, top each with a small dollop of sour cream, the remaining browned kernels, chopped tomato, slice green onion, and feta cheese. This batch makes 12 cake fritters and they go fast so make accordingly!